In 1957, Arizona Public Service replaced all the light poles in Downtown Chandler. The new poles were too insubstantial to support the strings of colored lights that the town used in previous years. A committee, headed by Bill Wilson, manager of the JC Penney store in Chandler, was tasked with developing new Christmas decorations that would make Chandler the envy of the valley. Wilson, chosen in part because he had won the town’s residential decoration competition two years running, and his committee called for several new displays including: banners placed over the roads entering the city, decorations mounted on light poles, a “modern tumbleweed Christmas tree,” an animated Santa with reindeer, a nativity that would fill most of the west half of the park, and a western themed Christmas display. The greatest excitement for the new displays centered on the light pole decorations. The previous year, Earle Barnum had designed several wreaths made from silver painted cotton bolls, which were the talk of the town. The committee’s plan was to make 80 similar wreaths for every light pole in Downtown. The Chandler Arizonan gushed over the uniqueness and beauty of the wreaths and gave weekly updates on their construction. The Tumbleweed Tree almost appeared to be an afterthought in 1957. 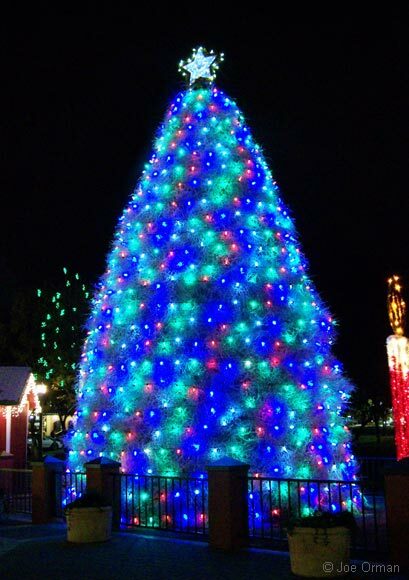 Mention of the tree in the local newspaper was scare, and the only photograph of the tree appears in the Christmas edition of the Arizonan. The Phoenix Gazette listed Earle Barnum as Chandler’s “decoration designer, ” thus starting the tradition of calling Barnum the father of the Tumbleweed Tree. It did not take long for the community to embrace the tree. By 1959, the wreaths were forgotten and the Arizonan newspaper was boasting about the “great Tumbleweed Tree.” The newspaper suggested that readers send photos and postcards of the tree to friends and relatives around the country in order to spread its renown. And thus, a great community tradition was born.